Welcome to Day 8 in a row of posting! 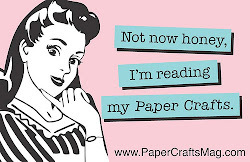 I was in and out of the Craft Cave yesterday in between doing other odds and ends around the house. I really couldn't sit at my desk for too long because I was starting to seize up - I took my second ever Pilates class on Saturday and as Sunday wore on I was getting more and more sore. I guess that means it was a good workout. It's something I've wanted to try for ages and have just never gotten around to. Lately though my lower back has been bugging me and I know it's because I have zero core strength so I bit the bullet and took advantage of a two classes for the price of one intro deal and tried it out. It's hard work and my core is even worse than I thought but I feel good at the end of it so I'm going to stick with it. Now on to the reason you're really here. I have two flower cards to share today. This first one is for the current Colour Throwdown challenge. I used an NBUS Altenew stamp set and fussy cut and popped up the flower and leaves for a little dimension. I didn't want the white band across the bottom of the card to be too thick so I trimmed out the top of the sentiment which I really like the look of. A scattering of gems around the sentiment and I was done! That's it for today. I'll be back tomorrow with the latest CASology challenge. See you then! Oh man...way to go on doing Pilates...I've never done them but have no doubt I'd be very sore too...zero core strength over here! Love your floral cards...the rich colors on the first one are amazing and of course I love the pop of pink on the second. Thanks so much for playing with us at Fusion! 8 days - way to go!!! 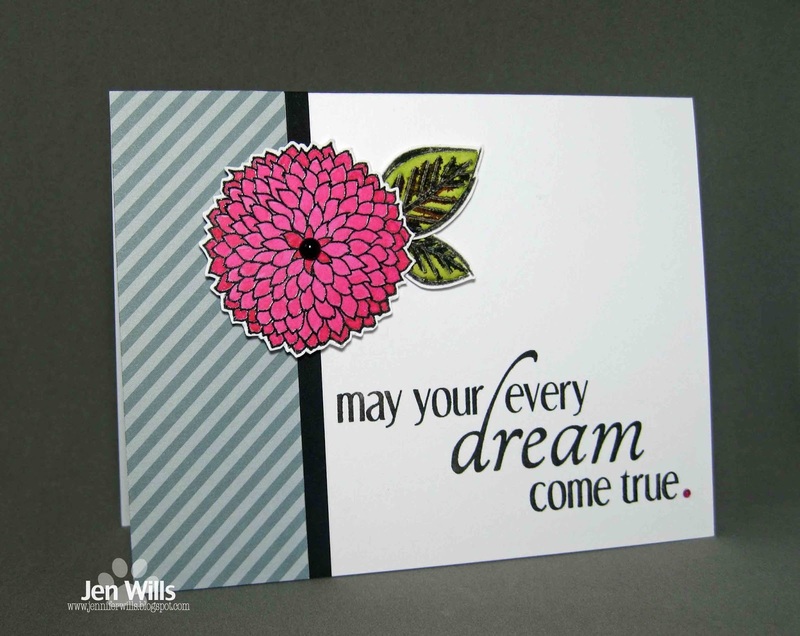 And you'll make 9 with CAS-ology..
Love your cards, Jen! The hibiscus flower looks gorgeous and I love how it pops against the thin white band and the grey base. 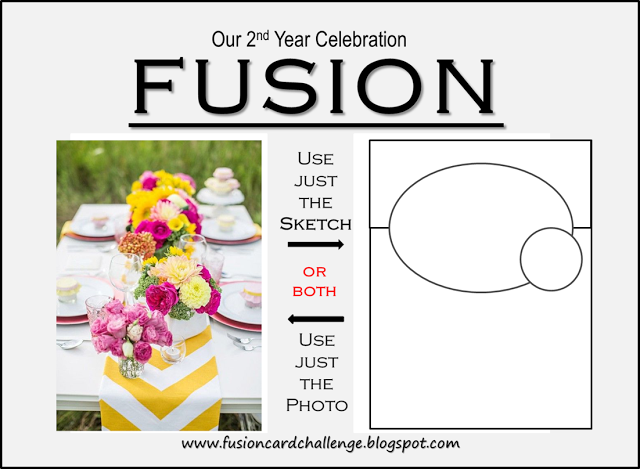 Your Fusion card is lovely and you rocked both the sketch and the color inspiration with that gorgeous flower! I have not tried Pilates yet but I tried Barre and felt the burn (and pain) after my first two sessions. It was so much fun though and I enjoyed it while I was able to attend - just need to find a new studio with a schedule that is compatible. That lily is gorgeous!! 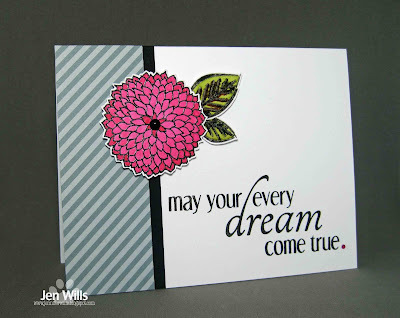 Perfectly stamped and perfect for the colors! Thanks for playing the Throwdown! Hope to see you again next time! Oh man, I hate to exercise LOL!! I could walk to the moon and back, does that count?!!? PRETTY cards today Jen. LOVE the second one to bits!! Oh I love the use of the gray/blues on both your cards, really makes the colors pop! What pretty cards!!! 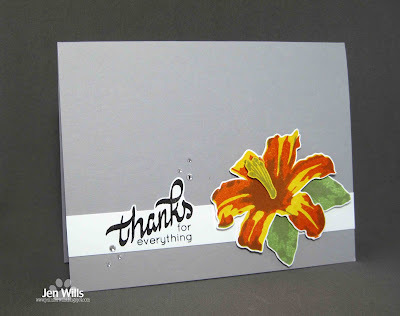 I especially like the orange and yellow lily...it really pops against the gray background!!! 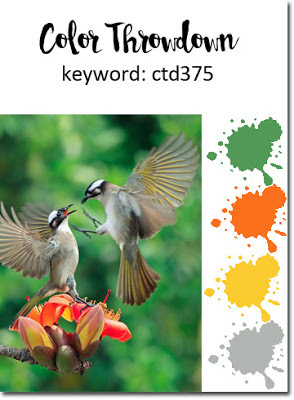 Thanks so much for playing along with us at the Color Throwdown Challenge!!! Bring on day 9, Ms. J-whoa!! This lily just popped right off of my monitor it's that life-like!! LOve the way you've trimmed that sentiment ... you are good ... really, REally good! Pilates? Good for you... and better you than me. ;) That lily is WOW!!! I think you've pulled enough inspiration from the Fusion photo that you've covered both parts of the challenge. Two beautiful cards! Keep it up, Jen. Both the Pilates and the posting. I love seeing what you're creating. 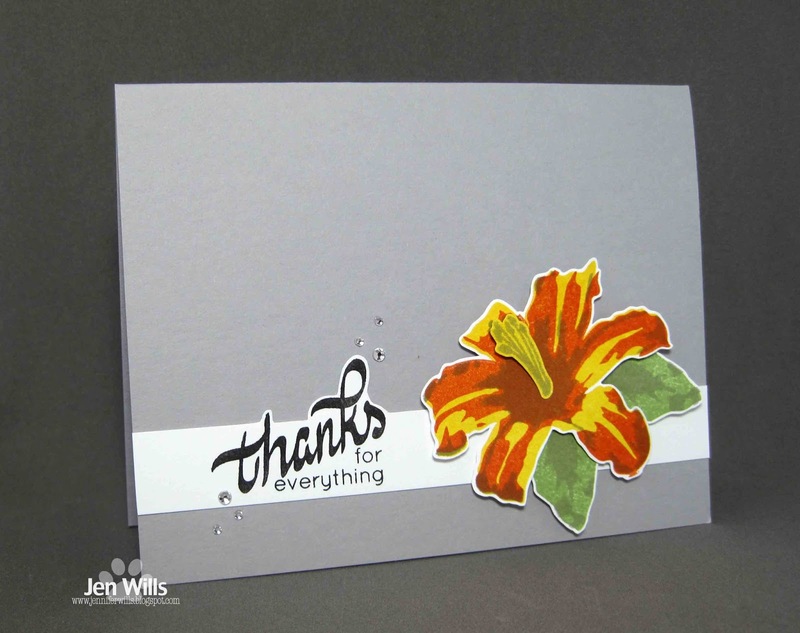 Love the lily and trimmed sentiment on the first and laughing about being distracted by the gray stripe. Gray is actually the trend nowadays and I think it's perfect with that pink bloom. Gorgeous flower. Great sentiment too. Jen these flowers cards are stunning. Love the colours you have used. Great to see you are doing Pilates and aching means it is doing you good! Oh good for you on the Pilates, I love them but have fallen off the wagon this past year so it will be starting from scratch again for me. Stick with it, it will get easier. These two cards at just beautiful! Beautiful cards, Jen! I hear you on the pilates! When I had my first class I wondered if it was even doing ANYTHING. Then the next day I felt it... haha! I did find that it improved my posture and core strength heaps. Maybe I need to go back.